We did see a patent suggested the iPhone 11 could have sub-epidermal scanning to unlock, in which the front camera would scan the veins and blood vessels in your face using IR to make sure it’s actually you unlocking the phone. As well as a better front-facing camera though, the iPhone 11 could also pack the snapper and related sensors into a smaller notch, as a new tech created by one of Apple’s camera component suppliers allows for some of the sensors to be placed under the screen. There’s no confirmation that Apple will use this tech, but we’d expect the company will be looking for ways to shrink the notch. Inside the device we’ve heard talk that the iPhone 11 will include support for the latest Wi-Fi 6 connection standards – though 5G tech might have to wait until the 2020 iPhones. Apple hasn’t launched an iPhone this late since 2011, when it announced the iPhone 4S on October 4, and we fully expect the Cupertino, California based firm to stick with a September arrival for the new iPhone in 2019. Finally, the new iPhone 11 release date – the day when you’ll actually be able to get your hands on the handset for the first time – could be just a week after the pre-orders open, so September 20 if our analysis is correct. These dates could quite easily shift though, and we wouldn’t be surprised if Apple followed more recent tradition and launch the new iPhone 11 on September 10. Even without the official iPhone 11 price, we know it’ll cost a lot. After all, Apple priced the iPhone XS and iPhone X starting at $999 (£999, AU$1,579). We could see identical prices for the iPhone 11. With news that Apple isn’t selling as many iPhones as it previously forecast, there’s a chance the iPhone 11 price will offer a more affordable look – although we reckon a price freeze, rather than a reduction, is a more likely move by Apple. What will Apple call the new iPhone 11? It’s a puzzling conundrum and there are a variety of different options for Apple to potentially pick from. It seems Apple has backed itself into somewhat of a naming corner with the recent XS, XS Max and XR monikers – so where does it go from here? The iPhone XS and iPhone XS Max are great smartphones, but there’s always room for improvement and human nature desires more every time – which means Apple needs to shake a few things up. 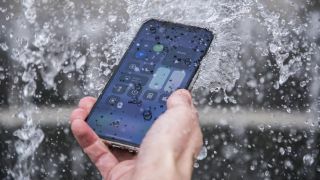 Here at TechRadar we like to think of the whole tech community as one great, big family who help each other out, so we’ve come up with a few upgrades we reckon would go down a treat on the new iPhone. Love it or hate it, the notch has taken the smartphone world by storm, with a sharp influx in the design aesthetic after the arrival of the iPhone X – however it seems many of the competition have already surpassed Apple’s implementation. The Apple notch is distinctive thanks to its size, but that’s also its Achilles heel. It takes up a large amount of space along the top of the screen while we seen Android makers bring us dew-drop screens which are only as big a single front facing camera. What’s preventing the notch from simply being ditched is all the tech Apple has crammed into it, and to remove it completely could mean a loss of some features – such as Face ID. Apple can probably relocate the microphone, proximity sensor and speaker, which in turn may see a reduction in size of the notch – which would be a step in the right direction. But, no notch would be the killer look – with a clean, elegant design that will surely turn heads. The current design of the XS and XS Max is fantastic – solid, premium and sleek, it’s one of the most desirable looks on the market, so is it cheeky of us to ask for something new? We don’t think so. Apple’s used the same design for the past two generations, and to avoid the new iPhone 11 being branded another incremental update, a fresh new look would help. It’s already removed the headphone jack and home button, so our focus is now on the alert slider, volume buttons and power key. We’ve seen HTC and Google implement squeezable sides on their phones, and if Apple can hone this technology to make it even more user friending it could be the end of any physical button or switch on the handset. We say this ever year, but the fact remains that iPhones still aren’t the strongest performers when it comes to battery life. It’s time Apple really got to grips with battery life, giving the new iPhone 11 a power pack that will see it comfortably through one day and into the next without a panic about finding a charger overnight. Battery technology isn’t going to give us the multiple days of battery life we saw from feature phones back in the early 2000s, but an iPhone that could stretch to two days from a single charge would really get people talking. The latest round of iPhones (the XS and co.) offer dual SIM capabilities, but they can only hold one physical SIM. That’s because the other one is an eSIM, which is built into the handset and can be assigned to a network upon activation. Having to slide a SIM card into a new phone feels rather old fashioned in 2019, so we’d like to see the physical card ditched in favor of a dual eSIM setup in the new iPhone 11. We’d also want an easy to use setting that allows us to easily jump onto a network of our choosing at a tariff of our choice and, more importantly, be able to easily switch to a different network when our current deal expires. However, with the introduction of 5G in 2019 and the presence of eSIM already inside one generation of iPhone, this ask isn’t totally out of the question.